'Tis the time to be jolly! 'Tis the time for holiday shopping, don't you think? If I were you, I'd take advantage of Super8 Grocery Warehouse's Super 3-day Sale to buy the goods I need for our holiday feast! 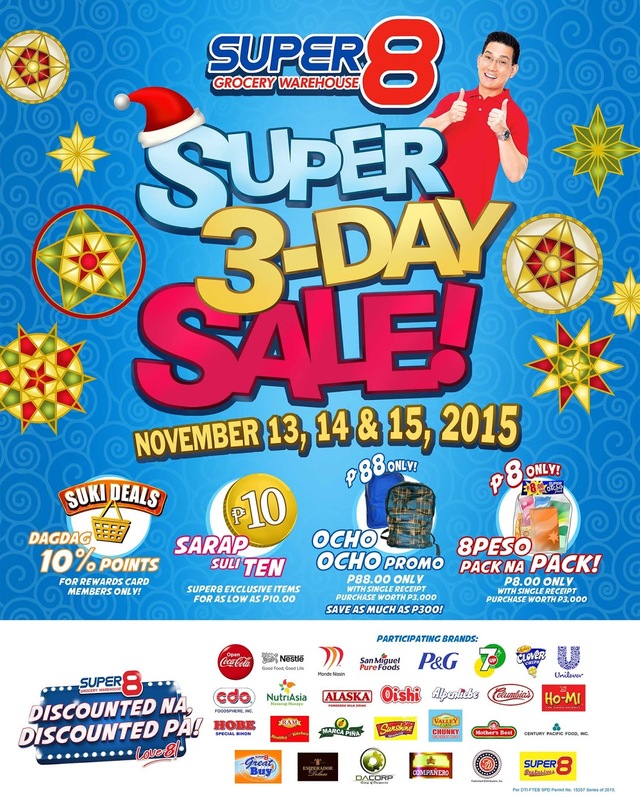 The Super8 Grocery Warehouse Super 3-Day Sale is happening this coming weekend, November 13, 14, and 15, 2015. 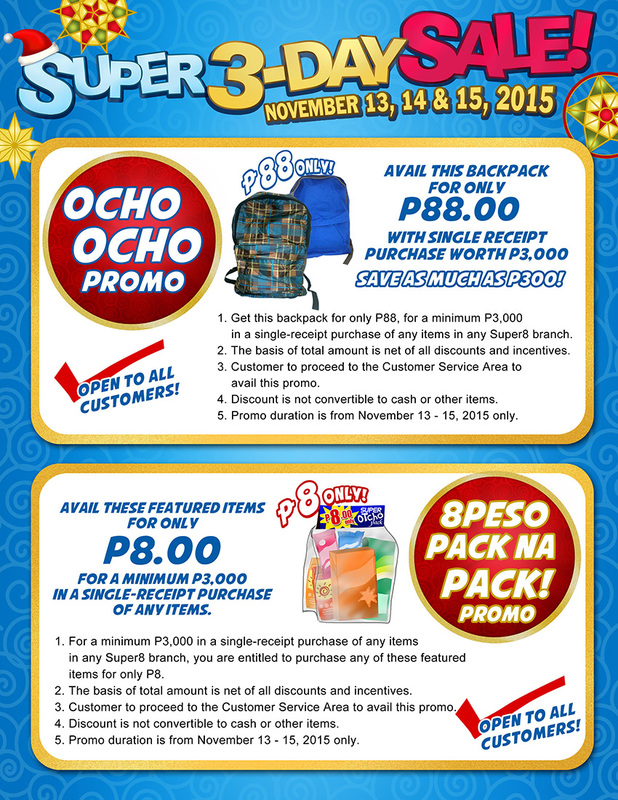 Enjoy Super8 exclusive items for 10 pesos! 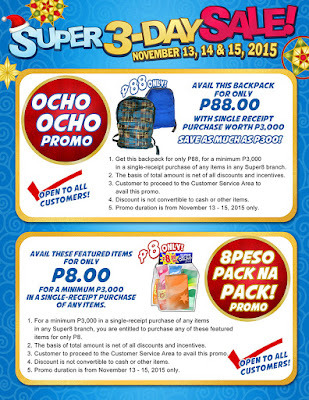 Best of all, with a single receipt purchase of Php 3,000, customers can enjoy 8Peso Pack na Pack items for only 8 pesos and a backpack for only 88 pesos! Rewards card members will benefit more from the suki deals with additional 10% rewards points so get your Super8 Rewards Card now. 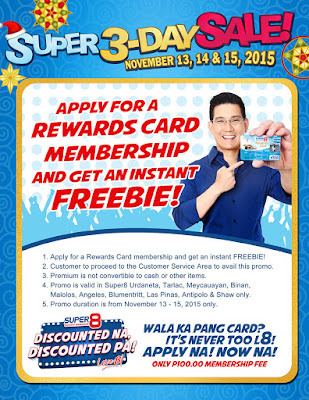 Rewards Card applicants in Super 8 Urdaneta, Tarlac, Meycauayan, Biñan, Malolos, Angeles, Blumentritt, Las Piñas, Antipolo, and Shaw get an instant freebie when they sign up during the Super 3-Day Sale! 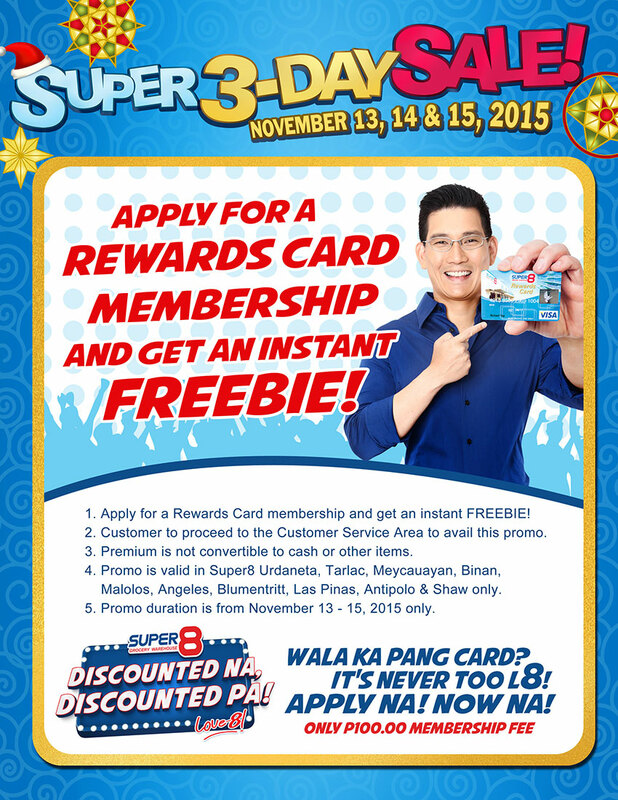 Make sure you save the dates and head to the Super8 Grocery Warehouse nearest you this weekend! You can find a Super8 Grocery Warehouse in Angeles, Antipolo, Baclaran, Baliwag, Biñan, Binangonan, Blumentritt, Caloocan, Caloocan Jackman, Cogeo, Dasmariñas, Ermin Garcia, GMA Cavite, Gagalangin, Guadalupe, La Huerta, Las Piñas, Libertad, Makati, Malibay, Malolos, Masinag, Meycauayan, Molino, Montillano, Muntinlupa, Novaliches Bayan, Ortigas Extension, Recto, Rosario, San Juan, San Pedro, San Pablo, Sapang Palay, Shaw Blvd., Southgate Mall, Santa Rosa, Sto. Rosario, Sucat, Tarlac, Taytay, Tatalon, Urdaneta, and Visayas Avenue. 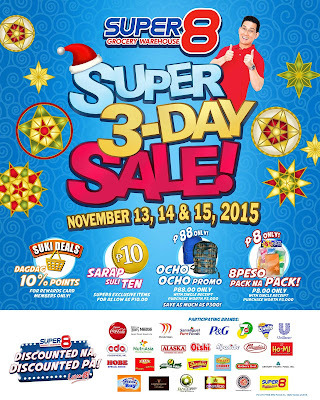 For more information on Super8 Grocery Warehouse Super 3-Day Sale, log on to www.facebook.com/super8.ph.